There are many benefits of dog beds, and most of those can be reaped by medium dogs, and especially large and extra large breeds. In fact, many pet owners consider best dog beds for large dogs as one of the key dog supplies to invest it as soon as you adopt your pet. We rarely think of our own beds as a cherished possession, but for dogs their bed is their safe zone that provides a huge deal of physiological and physical benefits. The best large dog beds provide the necessary joint and back support, insulation, warmth and most importantly, the feeling of security. * Click on the best large dog bed brand for more information, prices and details. Alternatively, scroll below to read dog bed reviews. Before we get into the dog bed reviews and talk about the industry's top rated brands and pick the best large dog bed for your big dog, let's talk about the types of dog beds, fill material and what matters. After doing a survey, it turns out many pet owners do not realize how essential a dog bed is for a dog, and that is especially true for big dogs. For this reason, we invited one of the experts from the industry and an experienced veterinarian to talk to us about the benefits of dog beds and how to choose the best dog bed for a large dog. You can find the full podcast interview here to listen to (or read the full interview transcript). As highly reputable and well-referenced source for pet owners run by vets, PetEducation have published a few good articles – this one and this one – on why veterinarians recommend pet owners investing in high quality dog beds for large dogs, and why to avoid cheap dog beds. Privacy and security for the dog. Every dog needs a place of his own where he can retreat and rest peacefully. While small dogs get many different options – from pillows and crates – for large dogs, this is often a big problem, since it's very difficult to find a dog crate that will fit a big dog. Prevention of many injuries. One of the main causes of joint problems in dogs and early onset canine arthritis is constant jumping. Dogs love to lie on beds, and when they don't have one of their own, they often choose yours, which requires jumping up on it and down from it constantly. Warmth and insulation. During colder months, a dog bed may be one of the easiest, best and cheapest ways to ensure your dog is warm by keeping him away from the cold, drafty floor area. Dogs love curling up on their beds to keep their body temperature at a comfortable state. Control of shedding for pet owners. A dog bed is the secret weapon of fighting shed dog hair in your home. Since your dog spends a lot of time on his dog bed, it's much easier to control all of your dog's shed hair and dander in a single place. You can easily wash the cover of most dog beds. Cushioning for dogs with joint problems. Arthritic dogs experience pain on a regular basis, but providing them with a comfortable orthopedic dog bed or even a plush dog bed can alleviate a lot of the joint pain through weight support. This is specifically true for senior dogs and overweight pets. Let's take a glance at some of the best dog bed for big dogs brands, and what exactly they entail that may benefit your pet. We've included our full reviews as well as most essential details about each dog bed. For tips on how to choose the best large dog bed for your canine, scroll down past the dog bed reviews. If you need tips for shopping for the best dog beds for large dogs (and small dogs), scroll down further below. What Is the Best Dog Bed for Large Dogs and Big Breeds? When a product bills itself as orthopedic, that means that it ostensibly is made with consideration for the cushioning of joints, bones, ligaments, and muscles. It shouldn’t be confused with a medical product, as it can’t cure anything, but it certainly is a good thing to look at if you have a dog with some orthopedic problems. We've tested the 7 inch Big Barker dog bed to see if it's actually one of the best dog beds for large dogs on the market today, as has been claimed by many pet owners and the manufacturer. This monster bed comes in three sizes: extra-large, large, and giant. The large size of Big Barker Orthopedic Dog Bed measures 48 by 30 inches, the extra-large measures 52 by 36, and the giant measures 60 by 48. All have a depth of seven inches. It’s shaped like a little bed, with a raised part on one side that almost forms a pillow-like shape. It comes in khaki, chocolate, and burgundy and is American-made by craftsmen in a California workshop. The canine bed is formed from “H10 Comfort Foam” and “H45 Support Foam.” The Support Foam is sandwiched between two thick layers of Comfort Foam. It comes with a 10-year guarantee that states that this doggy bed will retain 90% of its original shape for that time period. We weren't the only ones surprised by how high quality Big Barker turned out to be. 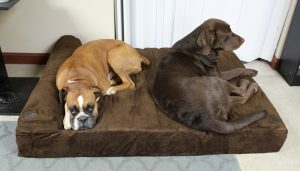 Customers were very satisfied with Big Barker Orthopedic Dog Bed. The sheer level of customer satisfaction is why we put this first on the list of best dog beds for large dogs. Customers with older dogs (such as one woman with an 11-year-old Lab) were pleased at the quality of the foam and how it cushioned their dogs’ sensitive bones and muscles, with most calling this one of the best dog beds for large dogs but one that comes at a price. People reporting back after an extended period of time also commented on how well the bed kept its shape—guess the ten year guarantee works after all! The key to a good dog bed is the quality of the foam underneath it and in this product’s case, the foam is the best around. A lot probably has to do with the fact that it is handmade and thus isn’t dulled by mass-production factory work. Usually, orthopedic dog beds that are less money sag in the middle and end up being useless or worse, making your dog’s bones and muscles develop problems or worsen existing ones. Customers reported that this was not the case and those who’d gone through pet beds before due to their giant animals collapsing the structure were pleased at the durability and resiliency of this equipment. It promoted a good night’s sleep and even the crankiest of dogs wasn’t able to find anything to grouch about with this bed. The only complaints noted by customers were the expensiveness (the price clocks in at nearly $300 retail) and the heat of the puppy bed. The dog bed is made of material that gets warm in the summertime if you don’t have air conditioning. If your dog is likely to use this constantly in the summer, a customer recommended a cool sheet to cool him or her down if necessary. Our multiple testing and many other reviews make it clear that Big Barker is one of the best dog beds for large dogs on the market bar none. This is the SUV edition of the Big Barker dog bed with a few additional features that are not included with the original Big Barker bed, but also lacking some of the main benefits of the famous 7-inch Big Barker bed. The key feature here is the shock absorbing support, which is why this dog bed is the best for cars and SUVs. Other than that, the design of this bed is the same as the above bed. 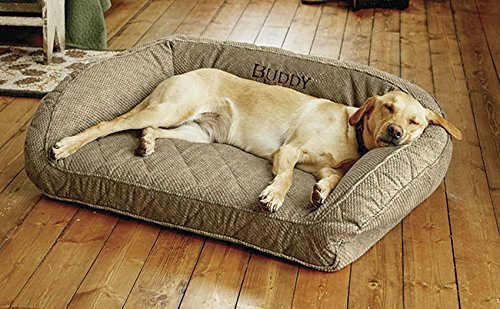 This oddly named orthopedic large dog bed is a very good alternative to the Big Barker bed, and it's about half the price in comparison. Even though it's not as carefully handcrafted as the famous large dog bed, many pet owners find that The Dog's Balls bed is perfectly sufficient for their big dogs. It's made from a high quality luxury memory foam and covered in a waterproof and machine-washable cover. They have sizes for dogs of any size, too. For pet owners on a very tight budget, this is one of the more affordable large dog beds in the similar design as the Big Barker bed. It's stuffed with soft plush polyester and has a waterproof cover, but the quality of these materials reflect its price tag. They offer these cheap dog beds for large dogs of any size, thus anybody can find a good fit, but it won't do for arthritic dog. This large dog bed works for dogs that are on the lower half of the large-breed weight spectrum (around fifty pounds). The bed size measures 40” by 24” with a height of 14.75 inches. This puppy bed looks like a miniature couch. This turned out to be second on our list of best dog beds for large dogs due to several factors, which I will now discuss below. Enchanted Home Outlaw Pet Bed has a back, little legs, and a cushion as well. Conveniently, it also contains a storage chamber for toys and treats. The cushion cover is washable (it can be removed for washing) and the material is plush, but won’t get too warm or too cool. It stays at an even temperature throughout at the retail price is $249.99. We didn’t put this product first on our list of best dog beds for large dogs because of the size constraints. If you have a mammoth dog, you might want to keep reading to the next item on the list, because this is for dogs on the smaller side of the large-breed scale. Customers who purchased this bed were satisfied with its shape and attractiveness, with one saying that, “If your dog likes your furniture, they’ll like this.” You’ll be able to sit on your own furniture without your dog trying to get up on it with you. It’s like having a miniature couch for your dog. Dogs love feeling included and they want to be part of everything going on in the house, so having a piece of furniture all to themselves—let alone one that matches their parents’—is a dream come true. The softness of Enchanted Home Ultra Plush Outlaw Pet Bed is good for dogs that have joint or bone problems and need a place to rest. Although this second one of the best dog beds for large dogs is not an orthopedic dog bed, the plush is comfortable enough and cozy enough that it provides a nice place to sleep for a dog that’s weary and sore. Just like us, other pet owners didn’t have any bad things to say about this large dog bed, though one noted that the cushion is a little overstuffed in the center and won’t lie perfectly flat. With time, your dog may be able to flatten that down, but it’s something to be aware of. For pet owners with large dogs on the smaller size, this can be a great alternative to the Enchanted Home Pet Outlaw Bed, and its half the price in comparison. This is a great looking large dog sofa-bed that will compliment any home decor, and this dog bed set is made using orthopedic memory foam for the filling. Its stain resistant micro suede cover makes it very easy to clean too. As another alternative to Enchanted Home Pet Outlaw Dog Bed is a product from their own line of large dog beds. This is a different design sofa-bed for dogs that looks much more expensive from the outside and will look great in your home; however, the inside of this large dog bed is made from cheaper materials and are likely to survive damage from very big dogs. For some pet owners on a budget, this is an affordable cheap dog bed for large dogs. After trying to find a sofa-bed for dogs from other manufacturers, it seems like the Enchanted Home Pet dominates this niche. This plush library sofa for large dogs is one of the best dog beds for big dogs as an alternative to the above mentioned item. It's different in design, and is somewhere in between the discussed second best large dog bed and the above mentioned sofa. The filling is plush and comfy but isn't as high quality, although it's more comfortable that the above option. Contrasting the aforementioned smaller-size large dog bed in the second spot, this pet bed works for dogs that are between 60 and 120 pounds. Orvis Deep Dish Dog Bed comes in a cute brown tweed pattern and is made by Orvis, a brand that is well-known for its quality dog products and equipment. It has Memory Foam stuffing and the outside is their ToughChew fabric, which is super-strong nylon that is soft, yet durable. If your dog is a chewer, this bed is for him or her because it will withstand pretty much anything. It’s a re-creation of a previous version of this bed—this new prototype is stronger and more durable. Even the zippers are fortified. Despite this roughness, it is soft and the Memory Foam is dependable and relaxing. We chose to place this third one of the best dog beds for large dogs because of the several complaints about the Orvis Company that were reported by a customer, which is unfortunate. Other than that, one customer described the bed as the “best I’ve ever seen” and most purchasers were happy about the quality of the bed and the expansiveness. Orvis Deep Dish Dog Bed is huge and comfortable and the Memory Foam is helpful for dogs that need extra cushioning. Memory Foam conforms to your dog’s shape and reforms itself to fit the outline and characteristics of your dog’s body, making it a flexible and versatile piece of equipment. Your dog doesn’t have to turn round and round to get comfortable; the Memory Foam is already set to your dog’s particular pattern. Memory Foam is frequently used in human products as well, which is what made it to be ranked as the third one of the best dog beds for large dogs since many of them require the high quality memory foam support. The outer lining of the dog bed, which is a reinforced Nylon, is easy to clean and you can even use spot-treatment to get out any dirt or debris. There is a bit of sticker shock to the purchase—it runs at $299.00—but it is long-lasting and can reasonably be considered an investment. Also, most human beds that contain Memory Foam are much more expensive as well, so if you think of this as a miniature scaled-down version, you’ll be able to rationalize the purchase. According to many pet owners' reviews, this may be one of the best dog beds for large dogs based on the price to value ratio. This large dog bed from PetFusion is a great alternative to the Orvis bed but has a higher price tag as well. In the bolster dog bed category, Orvis, Snooze and PetFusion are dominating the market by offering truly good quality big dog beds and great customer support. This bolster dog bed is made from good quality four inch memory foam and covered in machine-washable material. This is a great choice for dogs up to 150 pounds. As one of the new players on the block, Serta has started manufacturing decent quality, affordable cheap dog beds for large dogs that are worthy of attention. This orthopedic quilted dog couch slash bolster bed is one of their best products, and is made using their proprietary 4 inch orthopedic egg crate foam for pressure relieving comfort of the dog. Consider that it's twice as cheap as the Orvis bed, this is a good choice. BarksBar company has managed to manufacture the best cheap large dog bed of the same design as those offered by veterans like Orvis. About half the price of all of its competitors, this is one of the most affordable best dog beds for big dogs that is still made of great quality materials and will fit a wide range of large dog breeds. Its soft polyester cover is easily washable, and majority of dog bed reviews consider this the most worthy purchase ever. 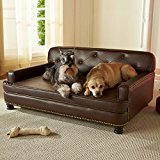 This dog sofa comes in a variety of different colors (brown, Hot Fudge, Peat, Olive, Saddle, Black, and more) and is made in three sizes: small, large, and extra-large. The extra-large size measures 42 by 29 inches and the large measures 39 by 28 inches. The depths of the beds are over one foot. Snoozer Luxury Overstuffed Sofa has polyester stuffing and has a micro-suede outer fabric that is removable for easy-to-clean maintenance. It can be removed simply by unzipping it. The fabric doesn’t retain odors, so you shouldn’t have to clean it super often. It’s shaped like a couch, so it’ll be like your dog has his or her own furniture to lie on. This product is fourth on the list of best dog beds for large dogs, as opposed to any higher position, because it isn’t as large as the other large-sized dog beds and there also were issues with this company’s customer service and packaging of the product. But when it came to the product itself, people were very enthusiastic and pleased with it (there were one or two complaints that we’ll address later in this review). Owners who were tired of their dogs sneaking onto their couches and beds were happy with the way this product was shaped—it was almost like its own little human couch. “Our dog loves it and stays off our couch now!” was a review, and many others were similar to it. The fabric, which is soft microsuede, is a big hit amongst dogs who found it comfortable and cozy. Despite it being suede, which those of us who own suede boots or coats know of, it’s not difficult to clean. This fabric is constructed different so as to make it simpler and not problematic to scrub. In that same vein of cleaning, one customer complaint revolved around how hard Snoozer Luxury Overstuffed Sofa was to unzip. Their zipper was stuck and, according to their extremely angry, all-caps dog bed review, it was therefore impossible to clean. Other customers didn’t note that they had this problem and considered this to be one of the best dog beds for large dogs. If a zipper is stuck, you should try olive oil on it. I’ve always found that that works. Another issue reported is that the brown and darker colors show hair and drool, so if your dog is a shedder or slobbers a lot, you might want to consider the olive, peat, or saddle colors instead of the black, brown, or other dark shades. While there are no great alternatives to Snoozer large dog bed of exactly the same plush design, this big dog bed from KOPEKS is a close alternative. The construction is somewhere between the Big Barker dog bed and the Snoozer plush one, but this one is much cheaper that the Big Barker while it's also stuffed with thick memory foam and covered with waterproof material that's machine-washable. With price being similar, it's just a matter of preference. As a new company for manufacturing best dog beds for large dogs, Beasley's has a good option for a slightly cheaper price than Snoozer or KOPEKS with a similar design. Unlike the other two companies, you can also order this one in four different colors. The materials, however, are not of the highest quality and will not provide as much support as mentioned best large dog beds. For pet owners on a very tight budget, AKC has a very cheap large dog bed that's designed after the Snoozer bed. It will fit a wide range of big dogs, however, the construction of this large dog bed is clearly cheap and is not great for long-term or heavy use. As some pet owners have already found out, this big dog bed goes flat fairly quick and renders itself unusable, hence a very low price. K9 Ballistics Orthopedic Microfiber Bolstered Bed comes in gray or khaki and its cover is made of polyester so that it can resist stains and other dirt or grime. It is machine washable and the inside is stuffed with 3.5 inches of high-density foam and 1.5 inches of Memory Foam (medical-grade). The five inches of foam make for a comfortable sleeping experience and the “bolstered” part refers to the seams of the bed, which are double-stitched and end in an extra-strong zipper for easy unzipping. The large size measures 32” long by 29” wide, the extra-large measures 46” by 33”, and the extra-extra-large measures 60 by 35 inches. This fifth one of the best dog beds for large dogs is listed as the final pet bed because it isn’t chew proof and the guarantee offered by the company doesn’t include chewing damage, something that owners with chewers for dogs aren’t going to like too much. Although the polyester cover is durable and very sturdy, the lack of chew damage guarantee is something to consider. Owners with dogs that were experiencing stiffness or discomfort were pleased with the way K9 Ballistics Orthopedic Microfiber Bolstered Bed conformed to their joints and didn’t cause their condition to worsen—in fact, the Memory Foam made it easier for them to get in and out of bed because they didn’t have to fiddle with it to find their perfect sleeping position. The bed is high-quality, and many customers were impressed by how tightly the foam expanded to fill the bed’s shape; there were no sagging or loose edges that their dogs could chew on. Dogs with arthritis were comforted by the shape of this fifth one of the best dog beds for large dogs and how it cushioned the canine. The hip area is especially benefited by Memory Foam, as that area is able to be stretched out because of the large size of the bed. The XXL size’s dimensions were also a feature that owners with Giant Breeds found most attractive. As aforementioned, the XXL length is five feet long, giving your dog plenty of room to stretch out his or her legs (though many dogs, it should be noted, tend to curl up when they sleep). This may be last on the list of best dog beds for large dogs, but it's worth a look. The only problem really mentioned by customers regarding this last one of the best dog beds for large dogs was the chewing problem. Owners whose dogs chewed on everything were disappointed at how easily this bed for dogs fell victim to their dog’s teeth. So, if your dog chews on everything—perhaps you have a teething puppy—this might not be the bed for you. As a great alternative to one of the best large dog bed options from K9 Ballistic, there's another offering from the same company. This is a high quality bolstered dog bed for big dogs, but at a much larger price tag. While the quality of this pet bed is almost identical to the above mentioned one, the higher price tag is due to superior exterior design. For some, the looks of this pet bed may be worth it. It appears that as some other dog bed manufactures own other niches of this market, K9 Ballistics have it covered for this specific type of bolstered dog beds for large dogs. This is yet another great alternative from K9 Ballistics which is much more affordable for pet owners on a budget. This cheaper big dog bed uses 1.5 inch thick memory foam and 3.5 thick support foam for filling. While it's fairly large, it won't fit the largest dogs out there but will be a perfect alternative to most pet owners. Dog owners on a tight budget and with medium-large dogs can save about $150 dollars by going with K%H Manufacturing bolster dog bed. It does not contain any memory foam, but for the cheap materials used, this is a good and affordable dog bed for joint and back support short-term. Surprisingly, this dog bed doesn't flatten for a long time, but I wouldn't trust it long-term for very large or arthritic dogs. 1-year warranty is a big perk, however. We all know that we need a good night’s sleep. We need it to function in the morning, otherwise we’re cranky and tired. There are even tons of health ramifications that can come from lack of sleep, as those of us who’ve pulled all-nighters know. But did you know that it’s just as important for our dogs to get a good night’s rest as it is for us? This list of best dog beds for large dogs will provide you some valuable information on picking the best place for your huge dog to sleep in regularly. Dogs sleep a lot—between 12 and 14 hours for every 24. Puppies can sleep for even longer, at around 18 to 20 hours because of the massive amount of energy they expend being puppies and running around wildly. Older dogs sleep more than the average as well. Dogs spend half their day sleeping and divide the other half into lying awake and being active. These sleeping habits change depending on a number of factors—age, weight, health, and other determinants that affect your dog’s lifestyle, which is why the best dog bed is one of the most important dog supplies an owner can get in the beginning, especially for large breeds that are prone to arthritis and other problems. With so many options on the market, it may prove difficult to find the best dog bed for large dogs and your specific pet. In order to make sure that your dog is getting the rest he or she needs, you need to have the right equipment for the job. Namely, one of the best best dog beds for large dogs that fits just right. Those of us with larger dogs—I have an Australian Shepard named Walter—know that sometimes it’s pretty difficult to find a pet bed that fits our dog’s size. A lot of dog products are geared towards medium and small-size breeds, as those outnumber the larger ones. A large breed dog doesn’t necessarily have a set classification as to what makes him or her large-breed, but the rule of thumb is generally a dog that grows to over 50 pounds when they reach their full weight. At that point, pet parents need one of these best dog beds for large dogs as the standard sized beds for dogs won't work anymore. Pet beds for large dogs do exist, however, and in this article, we’ll give you our top five picks for the best dog beds for large dogs that are truly popular on the market. You may be asking why your dog can’t just crash on the floor or on your human bed with you, and the answer to that comes down to dog training and pet health. A dog bed is usually optimized for a dog’s body and cushions their joints, bones, and muscles in a way that keeps them from experiencing soreness or discomfort. Also, it’s not advisable—though it’s certainly tempting—to have your dog sleep in your bed with you, just because that could undermine your authority. According to Animal Planet (and other sources), letting your dog sleep in your bed with you allows them to think that THEY, not you, are the alpha—or at least, they think that you two are equals which might seem to be superficially harmless, but actually isn’t because if your dog doesn’t respect your authority, they will do whatever they want. This is where one of the best dog beds for large dogs may come in handy, and improve the canine's sleep and joint support. It’s important to get your dog used to having his or her own sleeping space when he or she is a puppy; that way, they understand the rules of the house and can take up as much space as they want to. Because let’s face it, having your dog sleep in your bed means that he or she takes up way more space than they conceivably need to and they tend to seem impossible to move (do they gain weight when they sleep? It’s like moving a brick of lead). So, for everyone’s comfort, it’s best to get your dog their own sleeping area. And we can help you do that with this list of best dog beds for large dogs below. I've done thorough research and investigated what customers have had to say about each of these large dog beds—and they’ve said a lot. I'll give you all the aspects, good and bad, of the large dog beds as well as a brief overview of what they entail. Have a read and see which you think works for you! When perusing best dog beds for large dogs, think of several factors. First and foremost, know your dog’s dimensions and size. If this means pulling out the measuring tape beforehand, then so be it. Know his or her width, length, and weight. Select the large dog bed that will comfortable fit them when they’re stretched out, so as to maximize their comfort. You don’t want them hanging off the bed, hating it, and then begging to sleep on yours. If your dog has certain health concerns, take those into account as well and consider an orthopedic bed from our above list of best dog beds for large dogs that are ranked based on their health options. Large dog breeds can have issues that include osteoporosis, arthritis, and other joint and/or bone ailments that afflict them. Hip dysplasia, which causes the joints and ligaments in the hip to weaken and become discombobulated, is another common condition that affects large dogs. You want to minimize their pain and boost their recovery if they’re in it. To do this, you need to have the right equipment. Make sure the material of the pet bed is soft and pliant. If you wouldn’t sleep on it, don’t make your dog sleep on it. Think of the bed as needing to be up to your human standards. Don’t purchase products that are cheap or seem made cheaply. They could have toxic materials in them and will be a waste of money eventually, as they break down and fall apart. Another feature that you need to be sure of is how easy the large dog bed is to clean. Durability and cleanliness go hand in hand. The fabric should be tough enough to support your dog’s needs, yet clean enough to be thrown in the wash or simply hand-washed. You don’t want your dog sleeping on a dirty bed, but you also don’t want to be constantly buying new beds or recovering them. Getting the right bed for your large-breed dog means taking into account both your dog’s needs and your needs as an owner. When you're shopping for the best dog beds for large dogs that are made of high quality, there’s no reason to skimp on expense if you know you’re getting a product that will be dependable and long-lasting. Dog beds, though they might not seem like it, are an investment into your dog’s health and livelihood that will pay off big time in both the short-term and the long-term. The list we gave you above will hopefully help you make the decision that best fits both you and your dog. Happy shopping (and sweet dreams, too)!